NESCom student Kaci Rankins operates one of the school’s new Hitachi HD6000 cameras. Image Tim Burns. The New England School of Communications at Husson University has added three Z-HD6000 HDTV cameras from Hitachi Kokusai Electric America to the school’s existing complement of Z-HD5000 cameras for studio and field production. Based in Bangor, Maine,New England School of Communications at Husson University, NESCom, is home to approximately 500 students working toward undergraduate degrees in communications technology, mass communications and entertainment production. 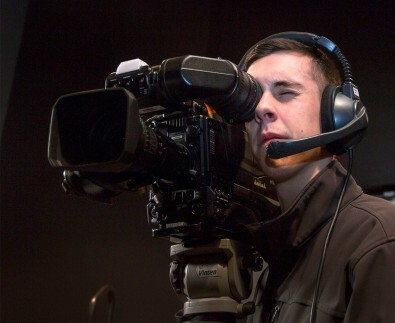 NESCom’s video production program provides real-world, experiential learning for students as they create live, broadcast productions within the university and through events with strategic external partners that complement the curriculum. NESCom also has agreements with local broadcast affiliates to air live Division III sports from the Husson University campus, as well as Maine’s only locally-produced, late-night talk show airing statewide. A business pitching competition show, broadcast throughout Maine over NBC affiliate stations, is also recorded at NESCom’s modern television facility. NESCOM student Alex Fenderson with one of the new Hitachi cameras. The new Hitachi Kokasai Z-HD6000 cameras are used in NESCom’s television studio to produce live newscasts in conjunction with the university’s journalism department, as well as public affairs shows, sports roundup programs and more. Meanwhile, six Z-HD5000 cameras are deployed with the school’s 32-foot remote production facility, NESCom Mobile Productions HD. The Z-HD5000s are equipped with a mix of studio and field production accessories and support equipment, enabling them to be set up for handheld, jib, dolly or fixed-position operation depending on the particular venue or event being covered.